Gunpowder Moon and The World Awakening are on sale today! Explore strange new worlds this week with new releases from Harper Voyager! David Pedreira’s debut novel is a taut thriller set on the moon, while Dan Koboldt wraps the Gateway to Alissia series. Don’t miss Gunpowder Moon by David Pedreira! Available now in both print and ebook. But war makes for strange bedfellows, and uniting Alissians against such a powerful enemy will require ancient enmities–as well as more recent antagonisms–to be set aside. The future of their pristine world depends on it. 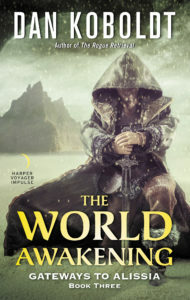 The World Awakening by Dan Koboldt is available now in ebook. Don’t miss The Rogue Retrieval and The Island Deception, both on sale now!